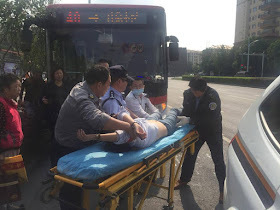 A few seconds after realizing she was going to pass out, Zhang Qian stopped the bus she was driving, asked passengers to get off the vehicle and called her bus company. Right after this, Zhang collapsed in her seat, losing consciousness. Zhang is a 39-year-old driver with over ten years of driving experience. She was driving the bus in Nanjing, east China’s Jiangsu province on Saturday afternoon before she collapsed. 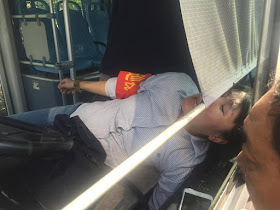 A video shows Zhang falling into her seat after passengers got off the bus. Right after the ambulance arrived, she was taken to hospital by paramedics. 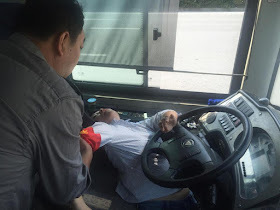 Zha Xuhui, the director of the bus company, confirmed Zhang is now in a good condition, and said her collapse was down to exhaustion. “This is incredible! She was so calm under pressure. I can tell how hard working she is in her daily work,” said one user on Sina Weibo. Many have praised her for managing to stop the bus and ensuring people’s safety, with over 30 passengers on the bus at that moment.